More Infos on Starhotels E.c.ho. The E.c.ho, our first ecological property, brings eco-chic to Italy’s fashion capital, which enhables a cutting-edge style combined with ethical substance. After a day discovering Milano’s lively center, step into a calming space where environmental conscience meets elegant design: warm, sustainable woods, organic furnishings, plenty of natural light. From the terrace overlooking a tranquil garden and Renaissance Chapel, to the fitness suite with panoramic views, the E.c.ho. is a breath of fresh air in the heart of the city. The Hotel is Green Globe certified and a winner of Hotel Excellence at the European Hotel Design Awards. www.conferencehotels.eu offers you a free and comfortable search for conference hotels in Milan. 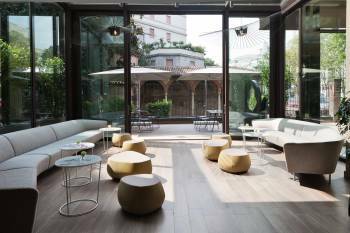 Here you will find the most popular conference hotels which Milan has to offer and which you can request directly online with the best conditions available.